For my third post, I am looking at battery based solar arrays and the things you need to keep in mind when designing them. Before reading, I would recommend checking out my previous post "Simple Sizing of Grid Tied Solar Arrays", especially it's section on Sun Hours. One of the biggest challenges in modern solar system design is how to properly design a system that includes batteries. Unlike a pure grid-tied system, a solar system with batteries consists of three separate systems all working together to create, store, and deliver energy for your electric loads. You need to ensure each component is properly sized for your specific energy needs and environmental conditions. This will explore sizing a stand-alone solar system based on an average daily load in watt hours that will be calculated from your usage habits or pulled from electric bills. For every load you want to include in your calculations, there needs to be an estimate of the average number of hours per day it will be turned on and drawing power and its power draw in watts. By multiplying watts times hours, you get the total amount of energy you need to run that load for a day. For an entire house, there are a lot of things drawing power at once, a lot of calculations that need to be done to determine the total amount of energy required. A good way to keep track of everything in is to use Affordable Solar’s Off-Grid Load Estimator. 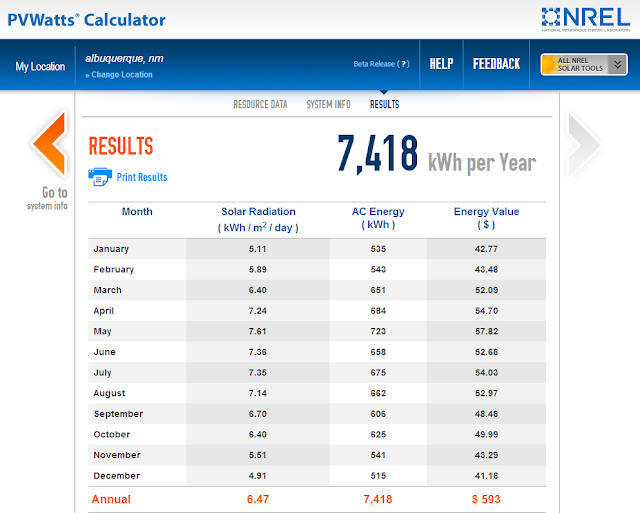 This online tool lets you enter any number of loads into the calculation, their size in watts, and hours/day in use. It sums them up and gives you the total watt-hours per day that your solar array and battery bank will be sized for. If the power/energy of an electric load is unknown, it can be determined using a “Kill A Watt” electricity usage monitor (or equivalent). 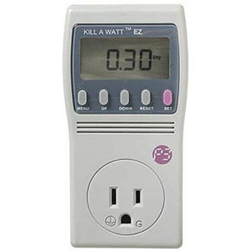 The “Kill A Watt” monitor can be used to find out how much energy is being used over time in watt hours. It is an excellent tool for finding appliance’s average daily load, and highly recommended for any battery based system sizing. While they may sound similar, ‘Power’ and ‘Energy’ describe two different things. Power is the amount of electricity being used or created at any moment in time, while Energy is the amount of electricity that is used over time. Watts are used to describe Power, and Watt-hours describe Energy. This difference is important for sizing the three distinct components of a battery-based solar system. The solar array and battery components are both sized based on the amount of energy (watt-hours) required per day, while the inverter and power panel are sized based on the maximum amount of power (watts) that will be used at once. To size your solar array based on the average daily electric load (either calculated or converted from monthly electric bills), you will need to know how much sunlight hits your site on a daily basis. If you have not read “Simple Sizing of Grid Tied Solar Arrays”, I would recommend you check out the section titled “Sun Hours” for help in finding this information. PVWatts can be used to find the available solar resource for a location for any orientation. Calculating the number of sun hours your site will receive, PVWatts outputs a table of results with values for every month as well as an average for the year. At this point, you will need to know if you plan on using a source of back-up power in addition to the solar array. An example of a source of back-up power would be a generator or the grid. This greatly affects the eventual size of the solar array. If you are using a source of back-up power for your system, then you can size the solar array based on the average daily solar radiation (sun hours) for the entire year just like a grid tied solar array. If there are no power source besides the solar array, you need to use the month that has the lowest value of sun hours for the year (in most cases December). Having back-up power lets you get away with a much smaller solar array. If you don’t have anything backing up the solar system, then the only thing keeping the batteries charged are the solar panels. Since the batteries are the critical component of any off-grid system, it is very important that their charge be maintained or you risk over cycling them, drawing them down too far, or otherwise overworking them so that they prematurely age and require replacement in 2-5 years rather than 10-15 years. Without an additional source of power to bail out the solar system when the sun hours are short, you need to size the solar array for the absolute worst case scenario or you’ll end up with a dead battery bank that requires complete replacement. The system efficiency factor η is usually estimated between 0.65 – 0.7 for stand-alone systems (0.55 – 0.6 for systems with a non-MPPT charge controller). You may notice that this is much lower than the ones used for sizing grid tied solar arrays. This is mainly due to the addition of a battery bank and charge controller, and the difference in inverter efficiency between grid tied and off-grid systems. Battery-based inverter/chargers typically have efficiencies in the range of 88 – 93% versus 94 – 98% for grid tied inverters. If the average daily load in Watt hours has been calculated already (from the “Load Estimation”), the only factors that need to be determined are the days of autonomy and the maximum depth of discharge. The days of autonomy represents the longest amount of time the solar array will have to deliver power for your loads while you are unable to charge the batteries from any source. This is mostly due to cloud cover that can block the sun for days at a time. With a grid tied solar array, there wouldn’t be any issues because the electric grid is almost always available. However, with a battery system, the batteries have to be sized to handle the possibility that there won’t be any other power available for days at a time. For most systems, 3 days will cover almost all scenarios and give you a sufficiently large battery bank. If you have reliable grid power available for backup, a smaller battery bank can be considered. However, if you live somewhere with consistent cloud cover or a long winter, you may want a battery to store enough energy for 4 days or longer. The maximum depth of discharge of a battery bank can be tricky thing to figure out. Its roots are in the properties of deep cycle lead-acid batteries used in renewable energy applications. A complicated discussion on these properties could follow here, but suffice to say that the less you use batteries, the longer they last. By setting an arbitrary point for when you stop draining batteries, you help preserve them and they will hold a charge for longer than if you fully discharge them. The longest-lasting and most robust battery banks are never discharged more than 20-30%. Most systems are designed to a 50% depth of discharge, which is enough to give you 7-10 years of effective life from your batteries if cycled and charged properly. Another reason to set a maximum depth of discharge is the chemistry of deep cycle batteries. 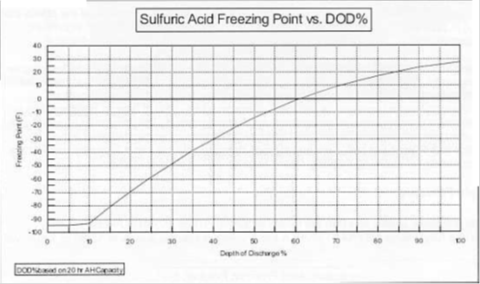 As you drain a battery, the acid in each cell becomes less and less acidic, and its freezing point rises. A fully charged lead-acid battery might not freeze in 0 degree weather, but a fully discharged one most certainly will because the “electrolyte” inside the battery is mostly water at that point. As a consequence of this, you need to be aware of where you plan on locating the batteries for a stand-alone system. If they will be somewhere where it could reach 0 degrees or less and if they are discharged below 60% charge they can freeze and you will have to buy a whole new bank of batteries. For more information on battery banks and their maintenance, check out “Extending Battery Life” in our learning center for an in-depth look. Sizing a battery-based inverter for a stand-alone solar system is a simple question. Unlike a grid tied solar array, a battery-based inverter is physically providing all of the power for your backed up electric loads. 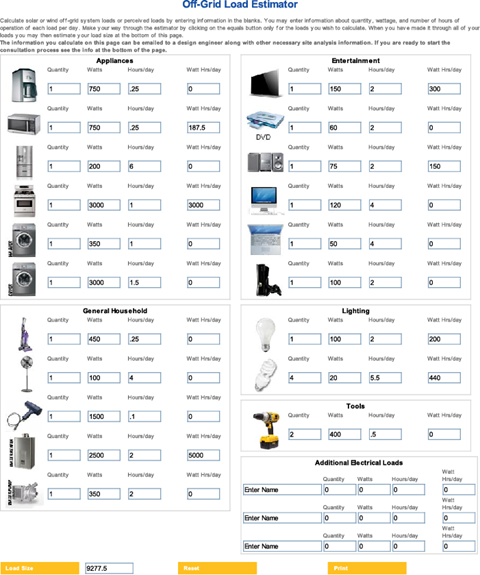 So, if you have 3000 watts of lights you need to run at once with your stand-alone system, you will need an off-grid inverter rated for 3000 watts or higher or there won’t be enough AC power to run all of them. When sizing an inverter for your loads, it’s best to come up with a “worst case scenario” where the most appliances, lights, and other loads will be running at once. The inverter needs to be able to handle your highest planned continuous power load. In addition to continuous loads, there can be “surge loads” that your inverter should be sized for. A surge load occurs when starting an electric motor or pump, usually for air conditioning units, well pumps, or shop tools. These power surges can be 2-5 times higher than the continuous load, and the inverter has to have the extra capacity to start it or risk being overloaded. Fortunately, most modern battery-based solar inverters have a “surge rating” for 1-10 seconds that is twice as high as their continuous rated output, allowing for some flexibility in determining how much AC power you should include. In the end, more AC power is better and you should always err on the side of caution when looking at how much you need for your battery based solar array. This post is really lucrative for every information seeker and person who is willing to put their efforts for better updates for battery manufacturing. Thanks for this post; Battery is the only source that assists to prevent us from the power demanding time, so choice of your battery should give at least minimum power consumption so better to buy your batteries from the battery authorized dealers.